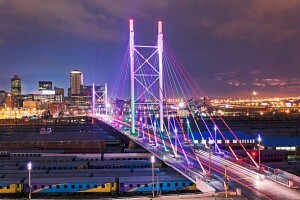 JOHANNESBURG – JOHANNESBURG is the most popular destination city in Africa. This is according to the annual Mastercard Global Destination Cities Index, which puts the City of Gold at the top for the fifth consecutive year. It attracted 4,05 million international overnight visitors in 2017. Marrakech in Morocco is the second most popular African destination city, welcoming 3,93 million international overnight visitors last year. Polokwane (1,88 million), Cape Town (1,73 million) and Djerba in Tunisia (1,65 million) rounded out the top five African cities ranked in the Index. Johannesburg also recorded the highest international overnight visitor expenditure among African cities with travellers spending US$2,14 billion in 2017, well ahead of Marrakech ($1,64 billion). On average, international visitors stayed over ten nights and spent $48 per day in Johannesburg, with shopping accounting for more than 50 percent of their total spend. “The City of Gold has once again topped the ranks of this year’s African index, with its mix of shopping and tourism offerings still hitting the mark with international travellers,” says Mark Elliott, Division President of Mastercard Southern Africa. He said the ranking was significant for Joburg’s economic prospects as visitor expenditure contributes an important source of revenue to the retail, hospitality, restaurant and cultural sectors. Johannesburg Executive Mayor, Herman Mashaba, said the index rating affirmed the city’s position as the major economic and cultural hub in Africa. “As the strong numbers of visitors from our neighbouring countries show, Johannesburg is one of the continent’s most significant metropolises for business, trade, investment and leisure,” Mashaba said. The Mastercard Global Destination Cities Index ranks the world’s top 162 destination cities in terms of visitor volume and spend for the 2017 calendar year. This year’s Index ranks several major African cities including Cairo (Egypt), Nairobi (Kenya), Lagos (Nigeria), Casablanca (Morocco), Durban (South Africa), Tunis (Tunisia), Dar es Salaam (Tanzania), Accra (Ghana), Kampala (Uganda), Maputo (Mozambique) and Dakar (Senegal) among others.